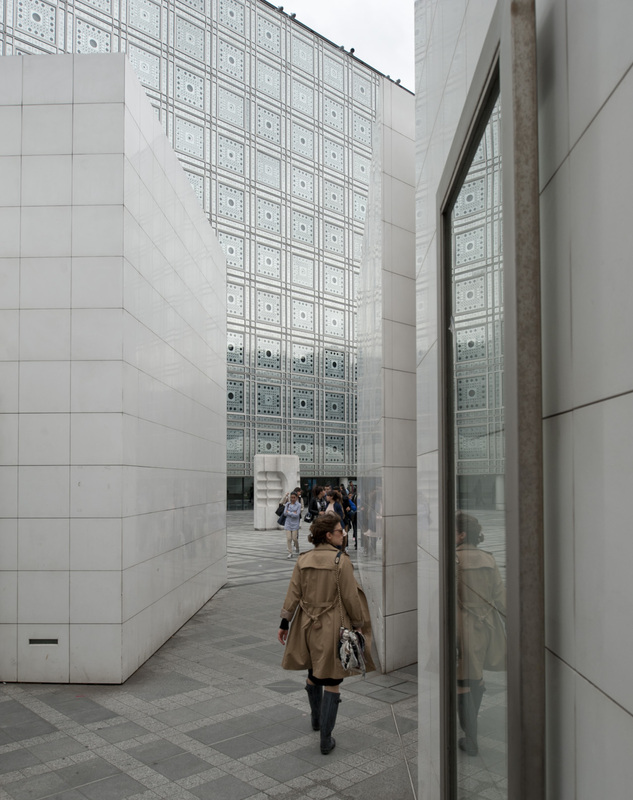 We kicked off our trip with a stroll around the 6th arrondissement, where we’re staying for the first several days. 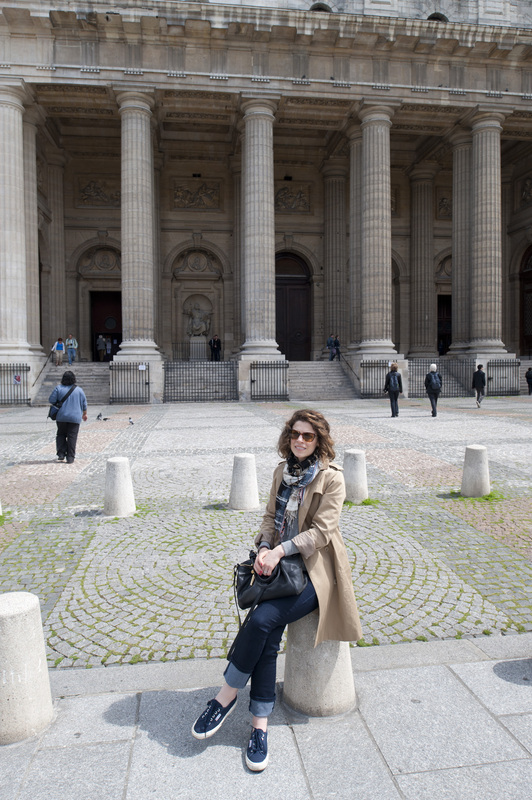 Here, Elizabeth takes a break in front of Saint Sulpice. 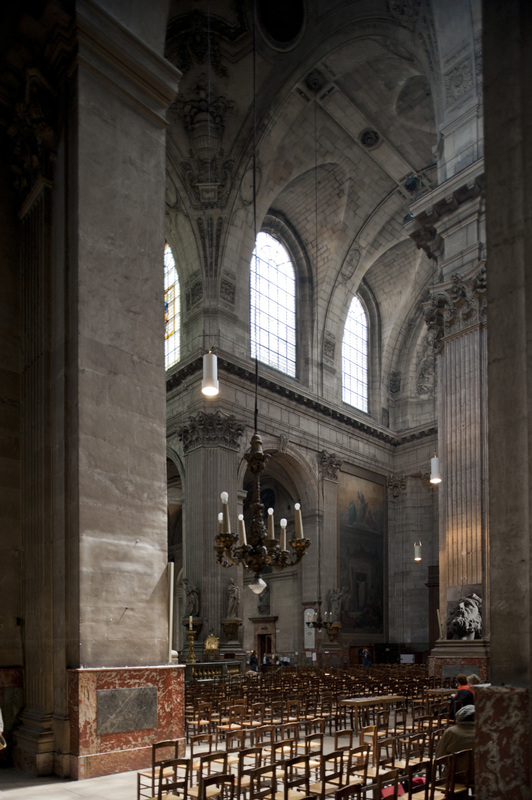 Despite the overcast sky outside, Saint Sulpice delivers dramatic lighting. 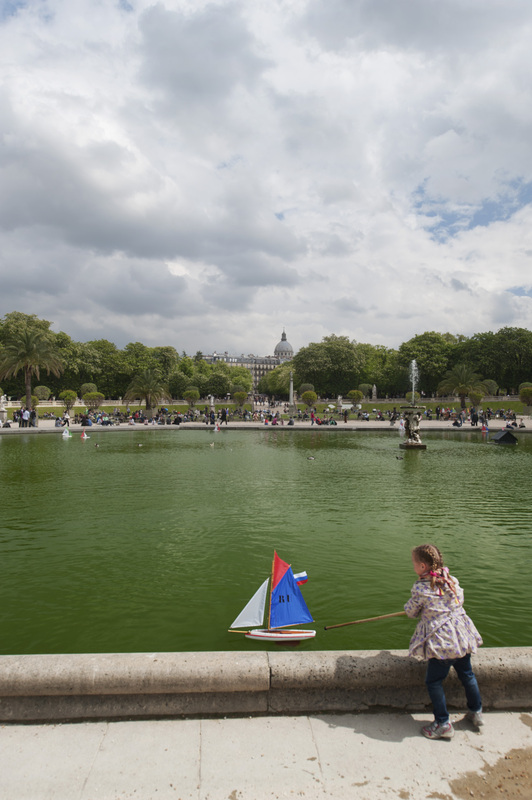 On our stroll through the Luxembourg Gardens, we came across a huge group of children pushing sailboats around the fountain. It brought back a flood of memories of coming here as a child. 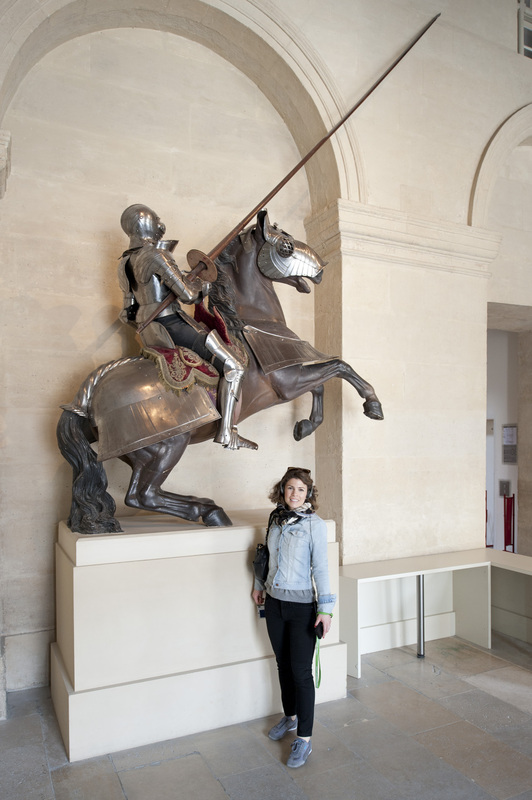 The next day, avoiding the crowds at far more popular museums, we went to les Invalides to take a look at the history of military costumes. 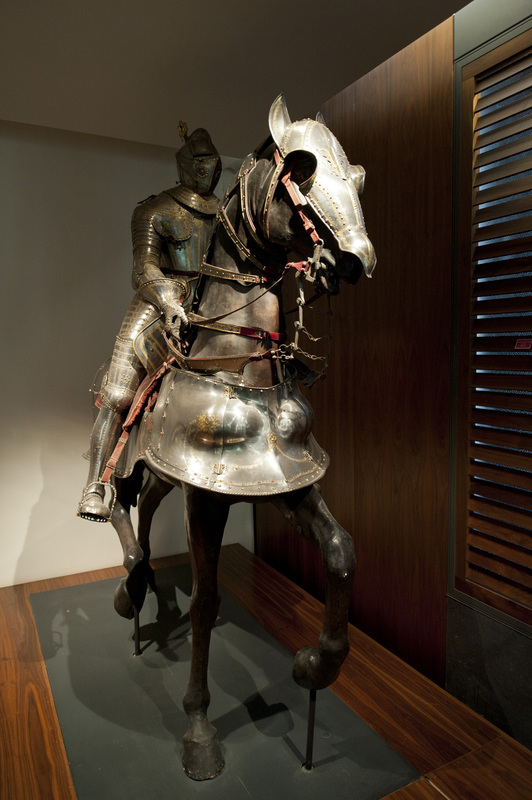 Although I’m only showing a couple of images here, the museum is well worth the visit to see the progression of fashion from the middle ages to World War II. There is no shortage of equestrian mannequins here. 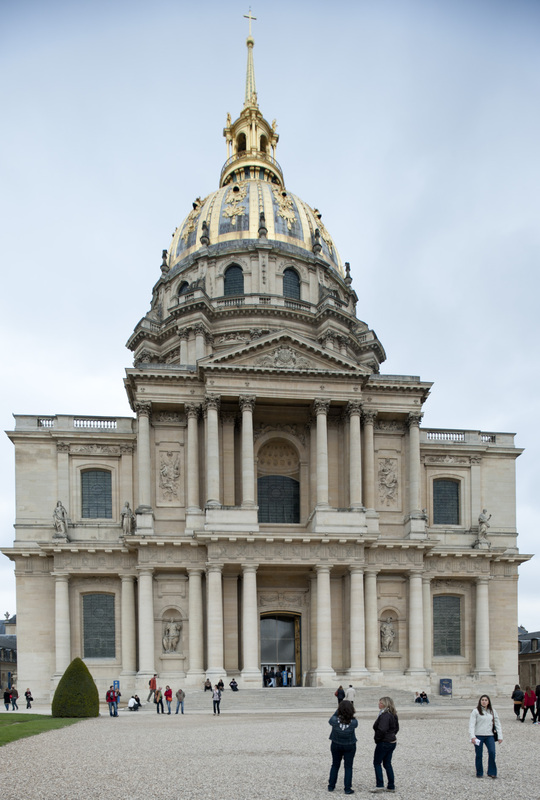 Les Invalides, which Louis XIV built as a veterans’ home, also features a magnificent Baroque church. 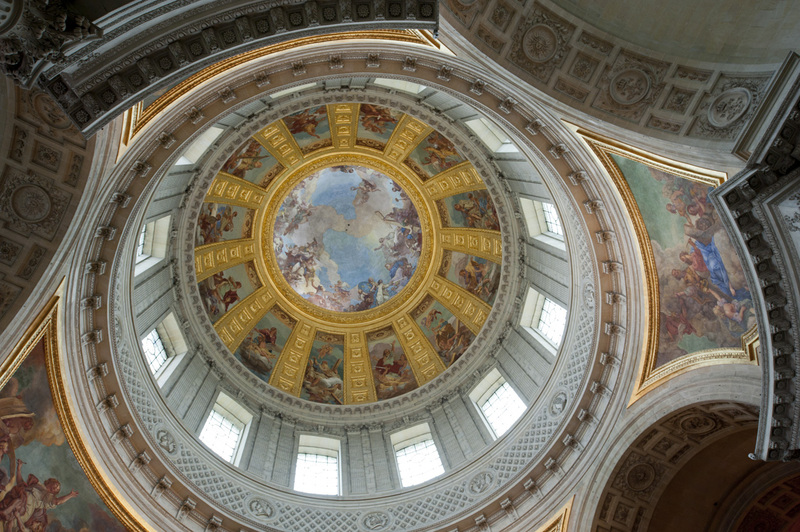 The dome of the church was built by Mansart to rival St. Peter’s in Rome. I’m not quite sure that the comparison does him justice, but it’s impressive nonetheless. 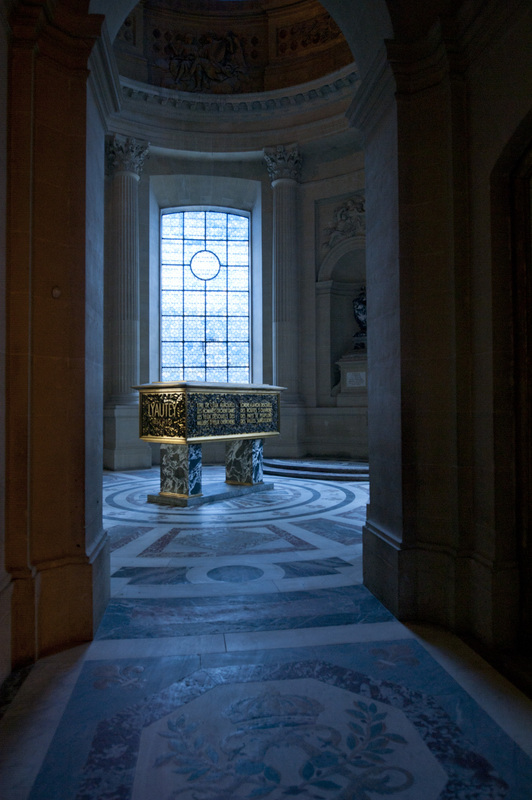 The dome now covers a crypt, which was built to house Napoleon’s tomb. 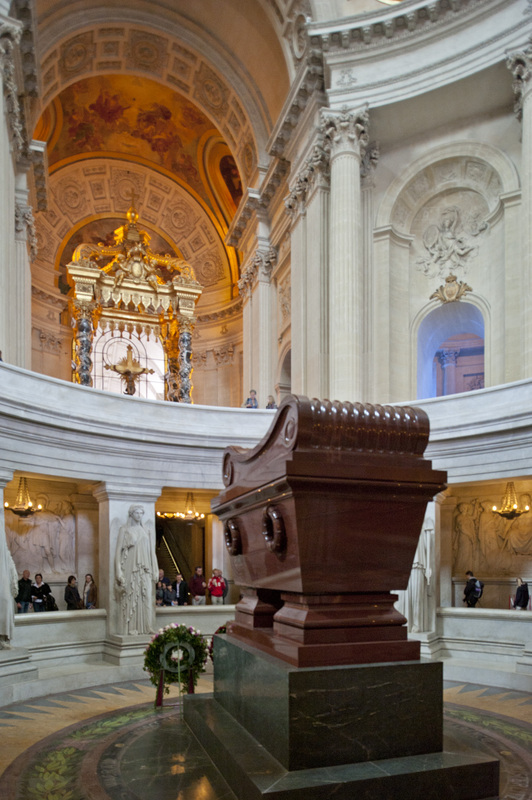 This is it, and his body is somewhere in there, supposedly within 5 nested caskets. The side chapels are bathed in soft blue light. The dome from the exterior. 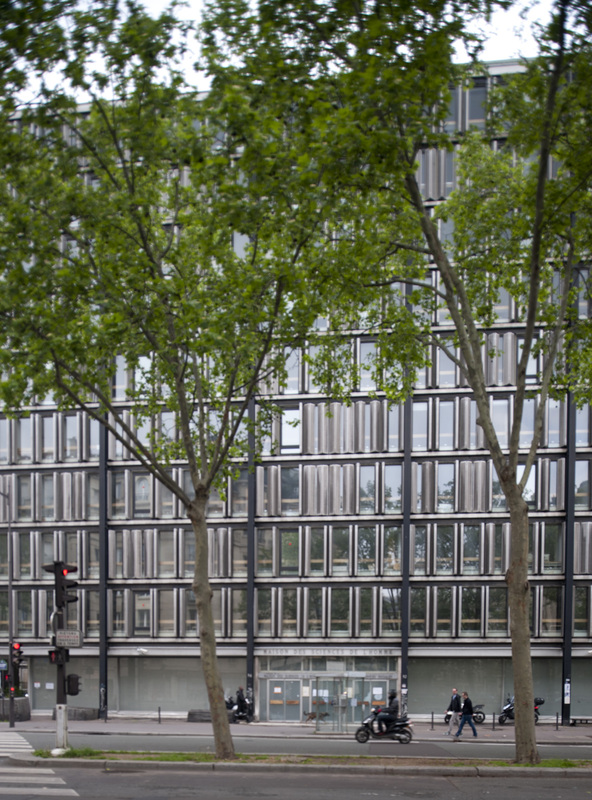 Not too far from les Invalides, we walked by the office building in which my father used to work. Not too exciting, but I never before noticed the adjustable exterior shutters. 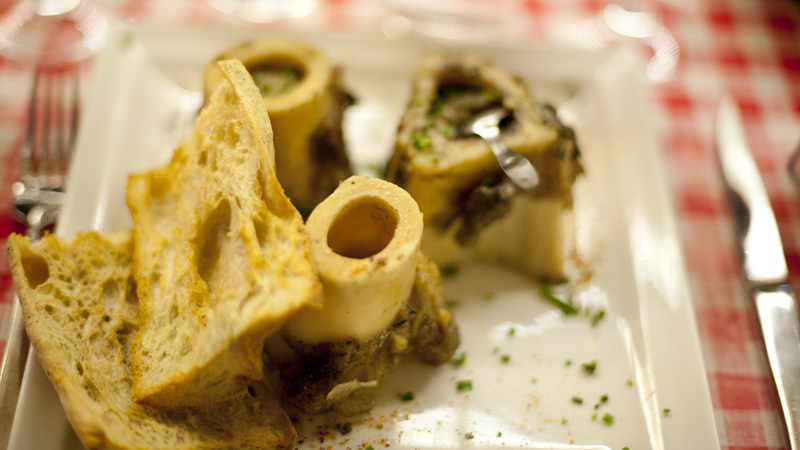 A bistro entree: bone marrow with toast. Delicious! Even Elizabeth liked it. 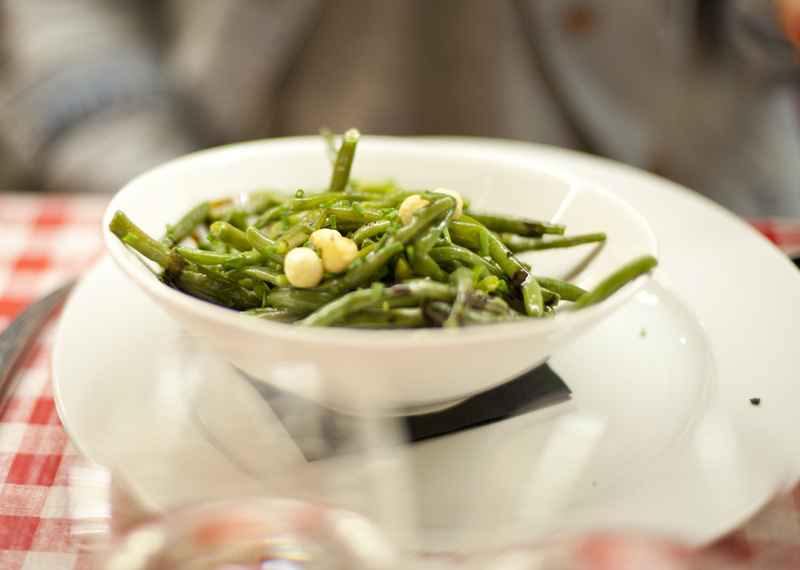 Elizabeth’s haricot vert, which sound much less pretentious when ordered in France. 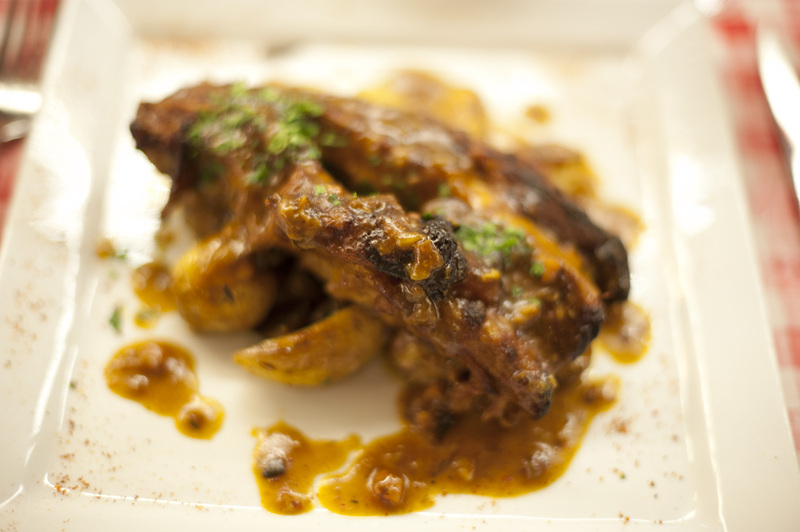 The waiter’s recommendation: braised veal. 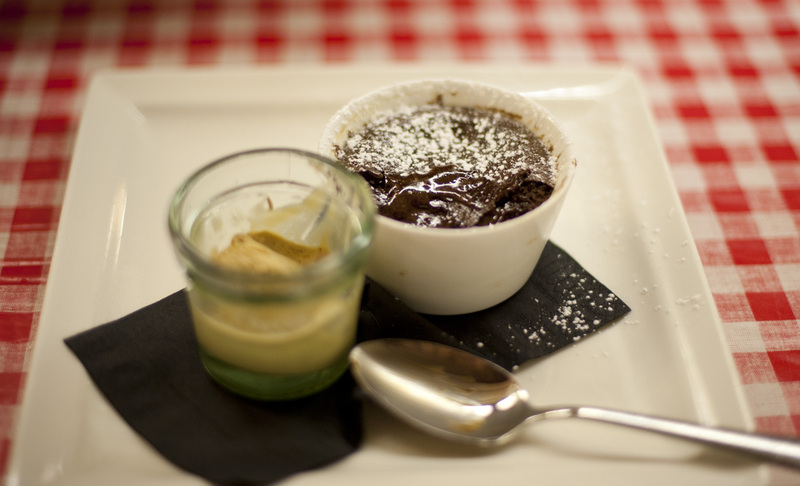 The best chocolate souffle that I’ve had in quite a long time. 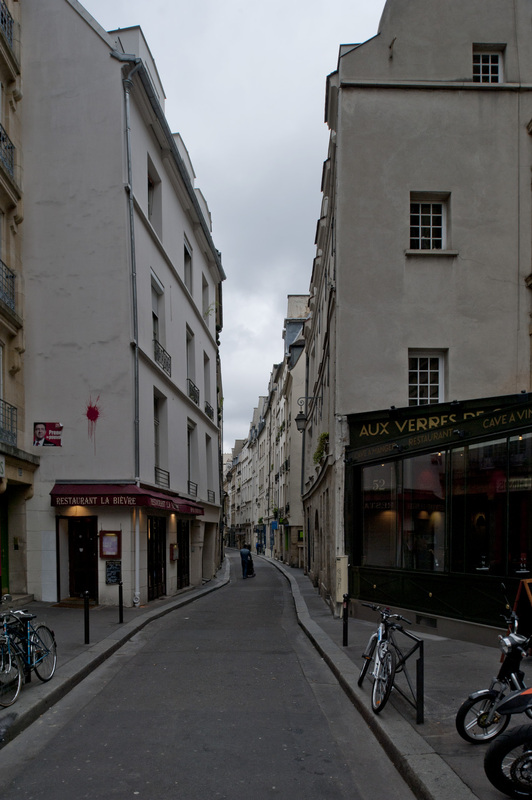 The next morning, we intended to go up to the flea market at Ouen. 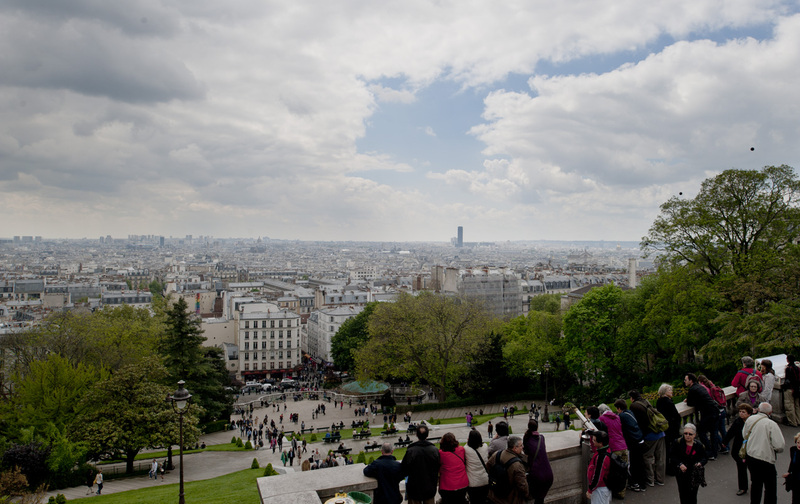 We stopped at Montmartre on the way, and never made it to the market. 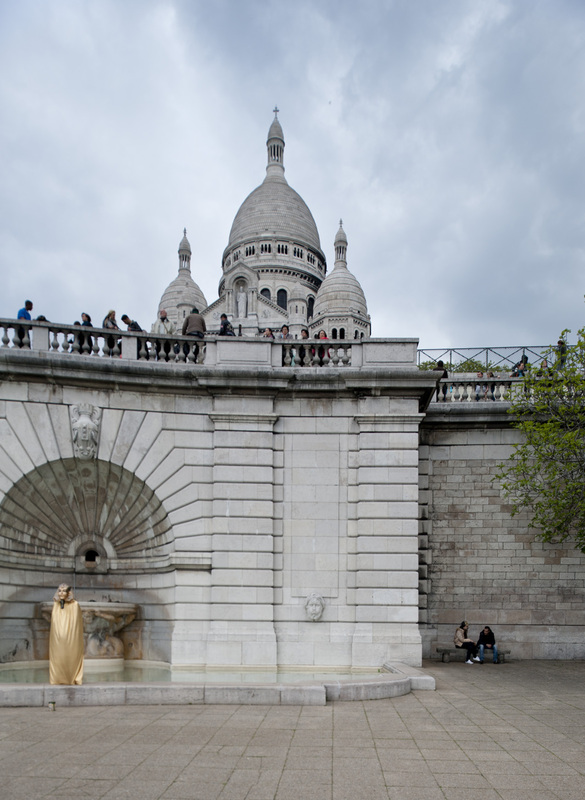 I’m not sure what King Tut has to do with Sacre Coeur, but I appreciated the effort. 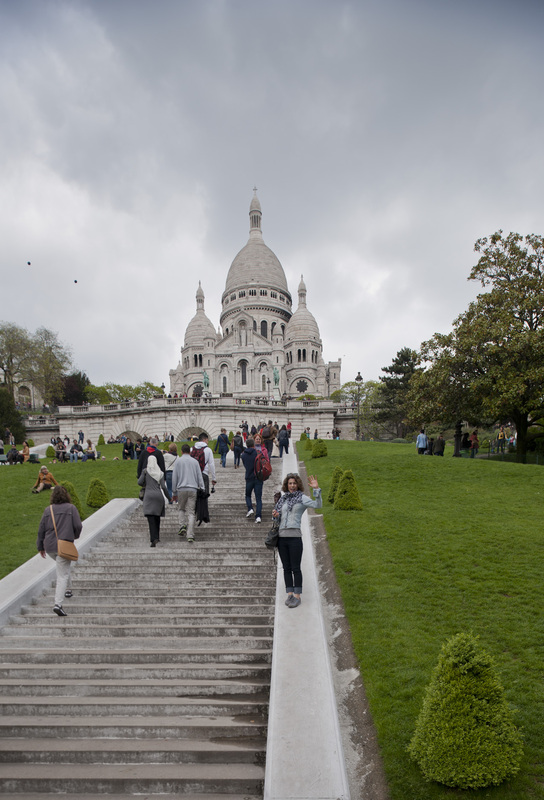 A brief appearance by the sun at the top of the butte de Montmartre. 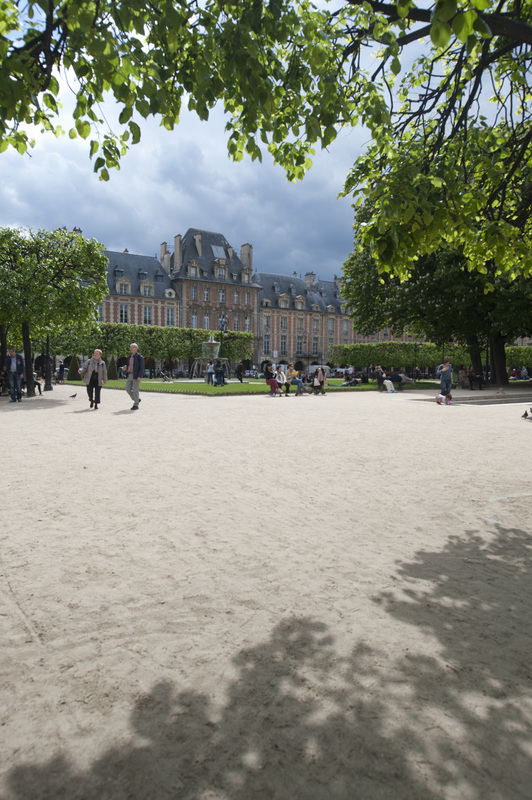 The sun gave way to forbidding clouds in the Place des Vosges. I recently saw this project in an architecture magazine. 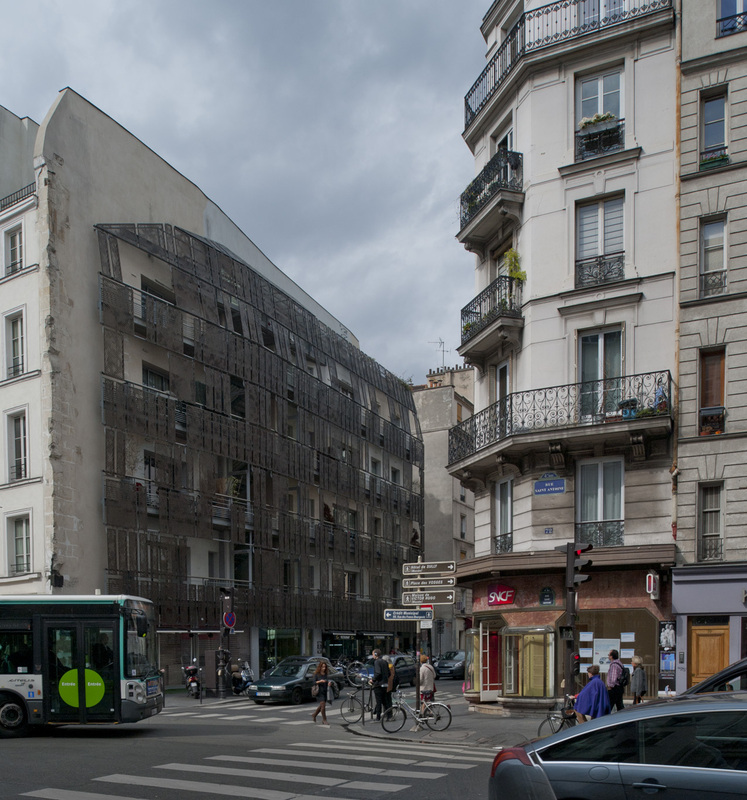 I don’t remember who designed it, but it is, essentially, a tiny sliver of a building added on to the side of an existing one in the Marais. The bottom floor houses some tiny shops, and the upper floors provide balconies for the apartments in the old building. 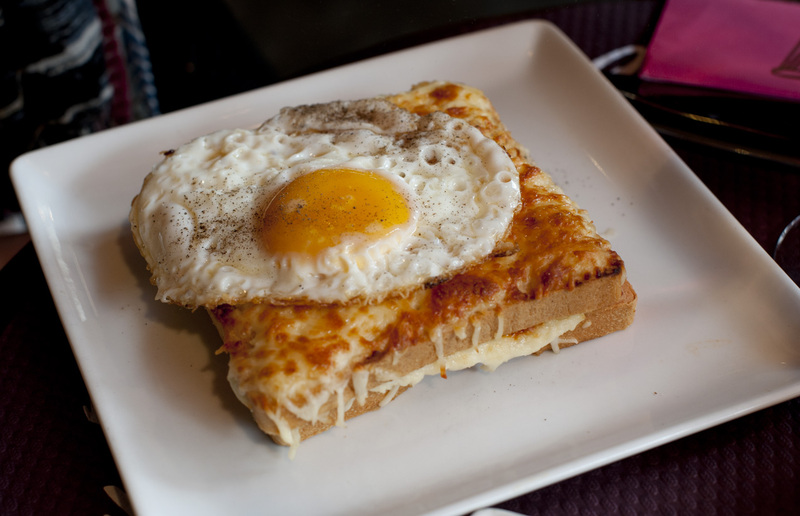 Heaven = a Parisian cheese shop. 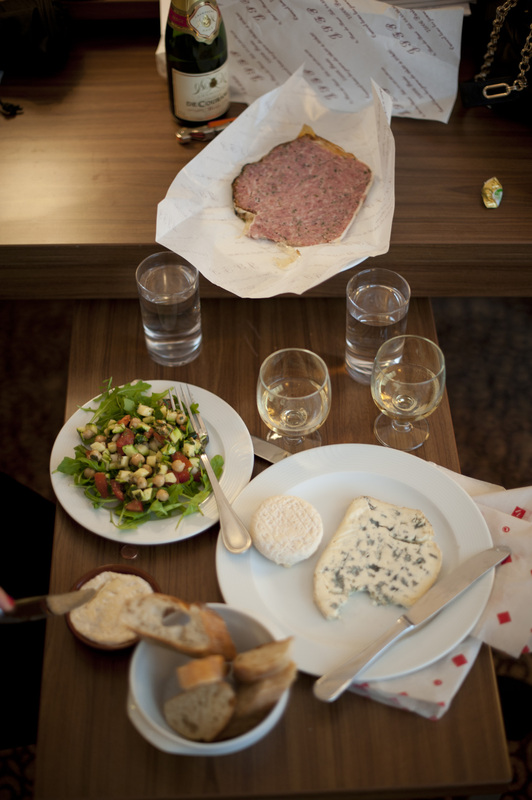 Not bad for self-catering: Cheese, veggie salad, and a country pate with herbes de Provence from our local charcutier. We had intended to get an early start on the day today, hopefully beating the lines at the local attractions, but ended up waking at 9:30. 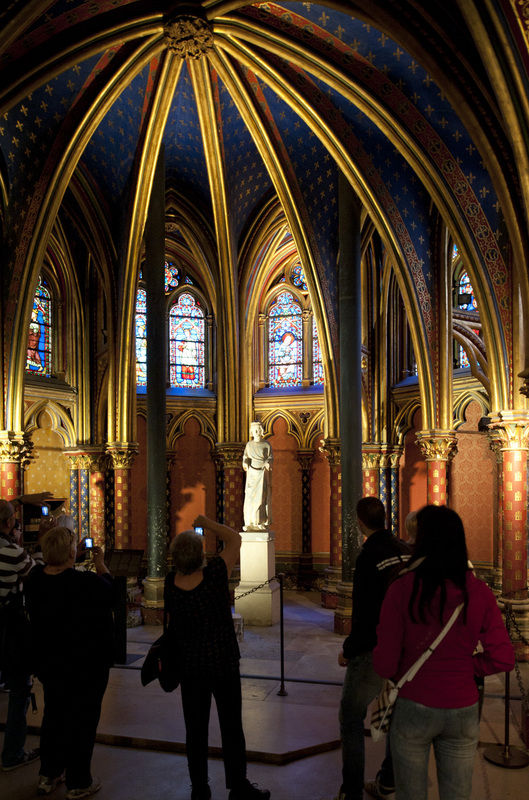 We hit Sainte Chapelle first, and the line turned us off to other popular attractions. The chapel was beautiful, though. 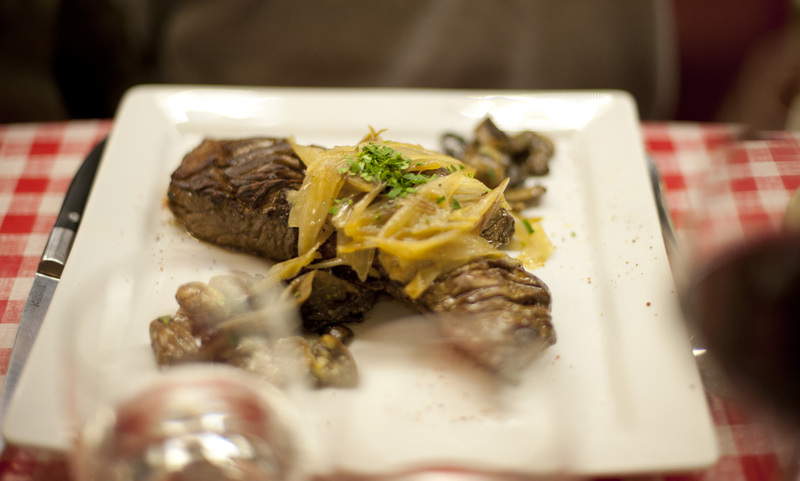 This is the lower portion. 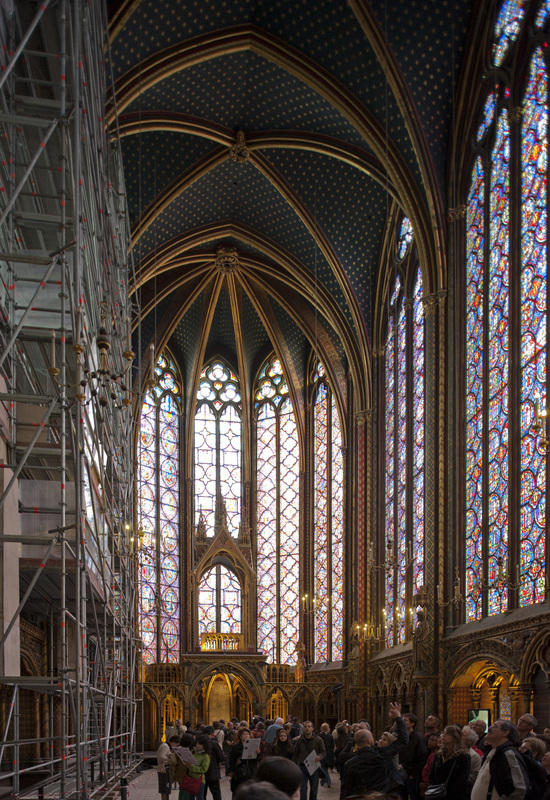 The upper floor of Sainte Chapelle. 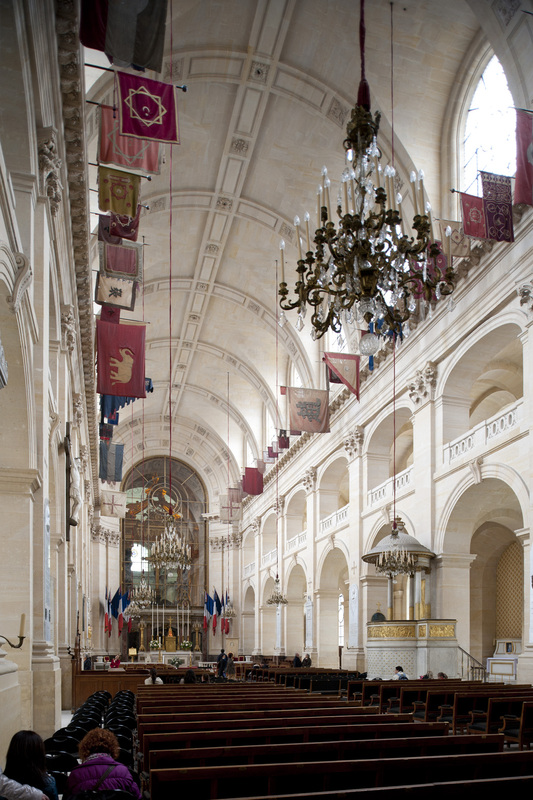 Louis IX (St. Louis) had it built to house the relics of the passion that he had recently purchased (pieces of the cross, nails, etc.). When the revolutionaries took control, they had most of the relics melted down. 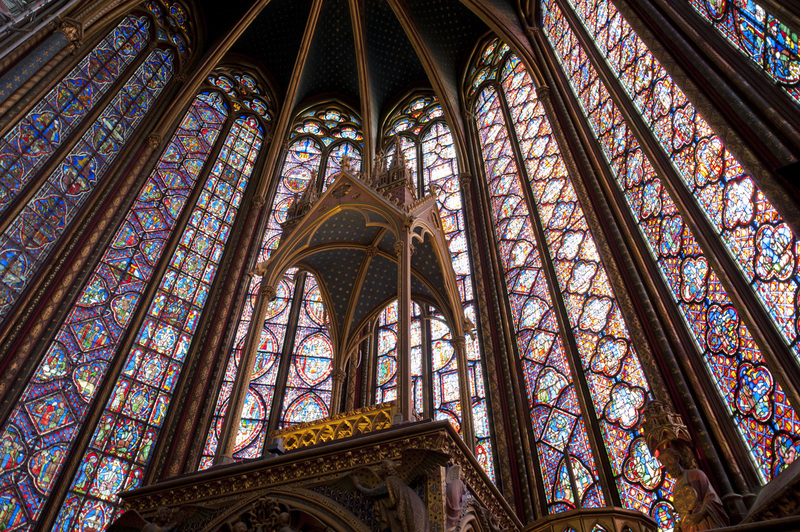 As far as stained glass windows and gothic ornamentation go, nothing really compares with Sainte Chapelle in Paris. 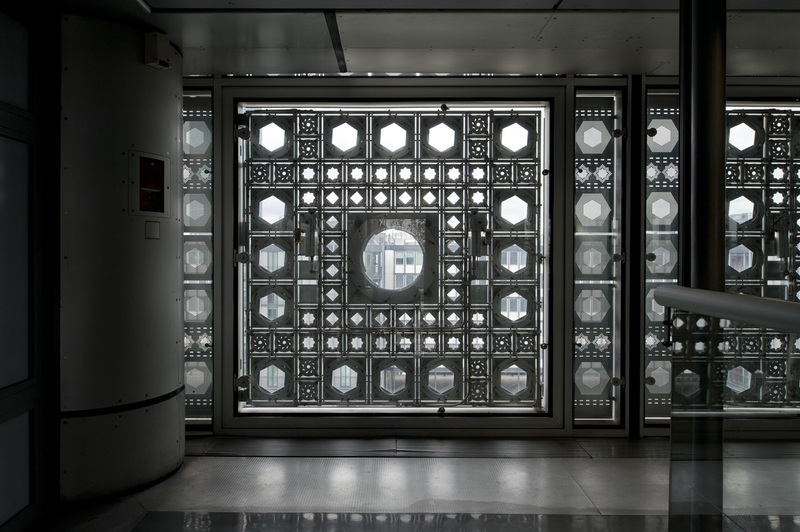 More ornamental windows: Jean Nouvel’s Institut du Monde Arabe. More about the facade below. Elizabeth makes her way to the entrance. 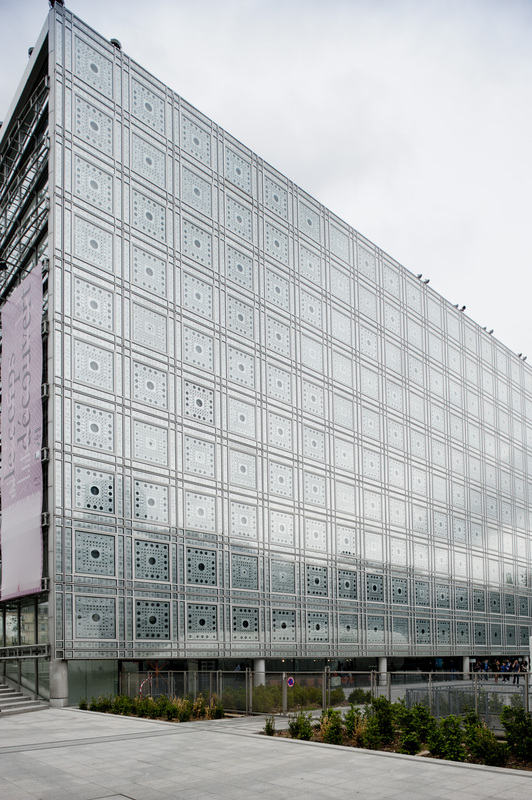 For those who don’t know, Nouvel created an active light filtering facade. 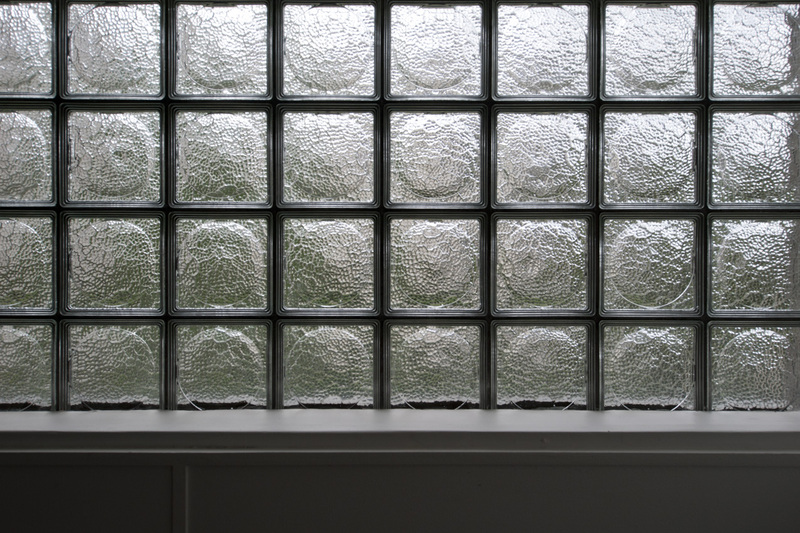 Behind the outer layer of glass is a field of irises that were meant to open and close according to the strength of the sun. Of course, they never actually worked properly. 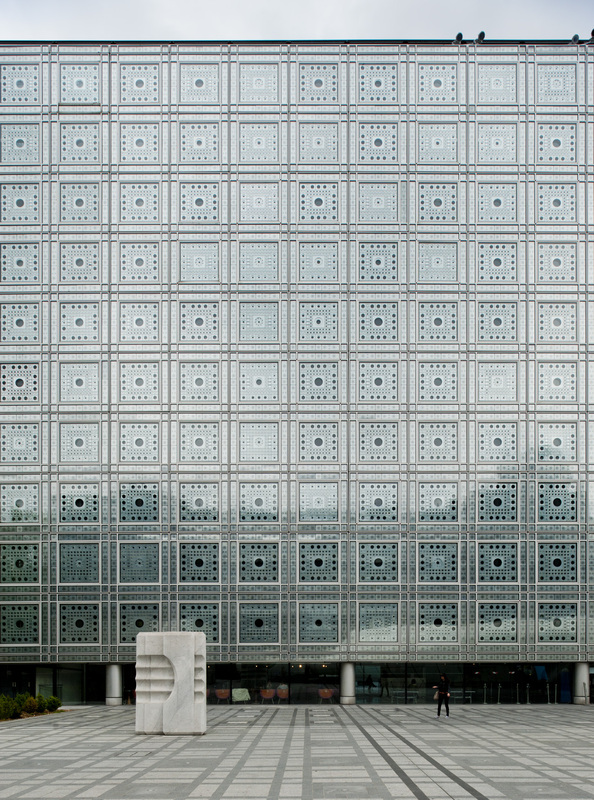 Nouvel was inspired by arabic tiling, and the irises become the ornamentation on the otherwise blank facade. Regardless of whether the system functions, it’s a stunning achievement. 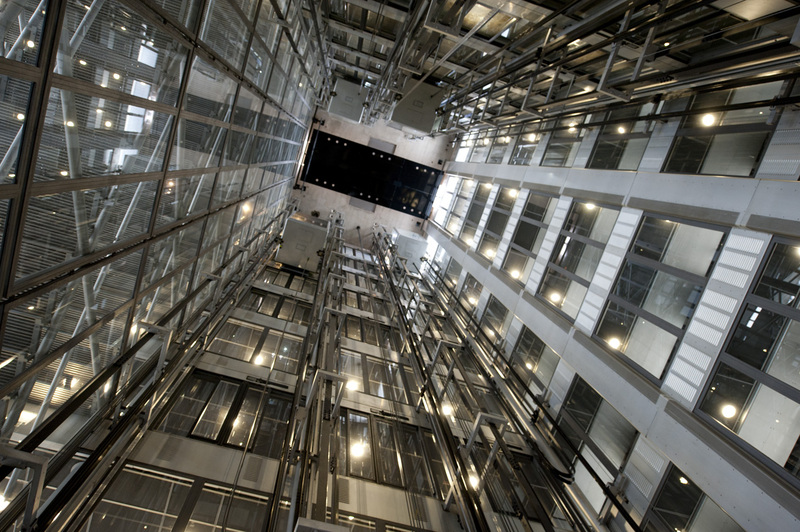 Visitors enter under a huge open elevator shaft. 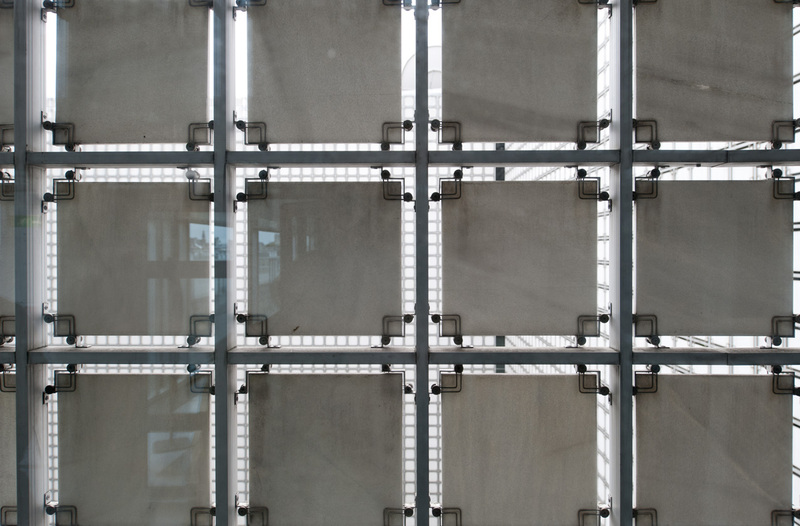 Wafer thin and barely translucent marble tiles screen an interior courtyard. 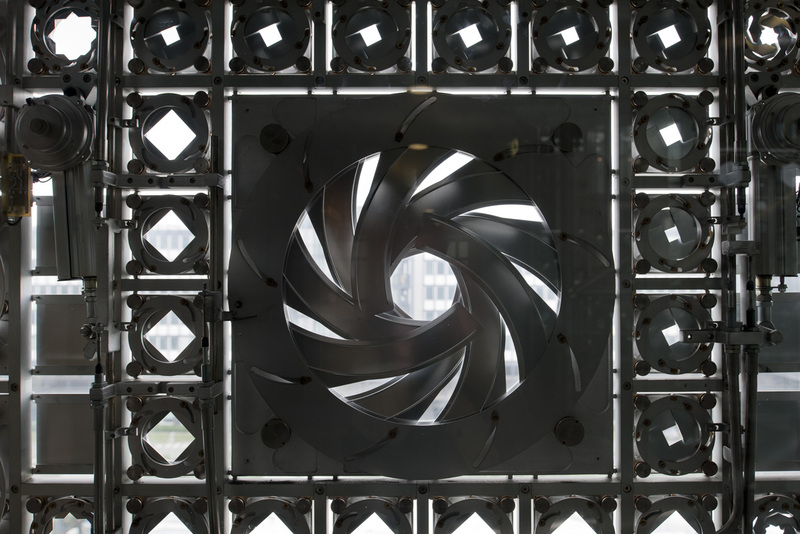 The courtyard screen is set off from the glass. 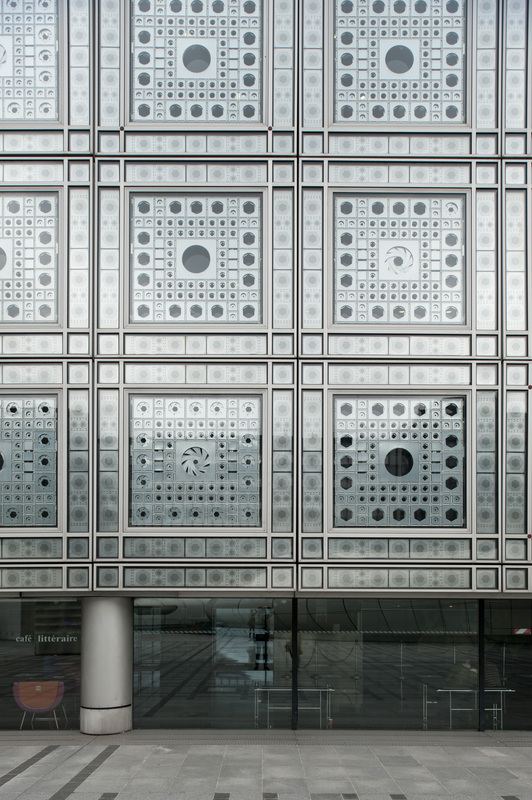 The brise-soleil from the interior. I wonder how anyone actually thought that this intricate mechanical system could be maintained. 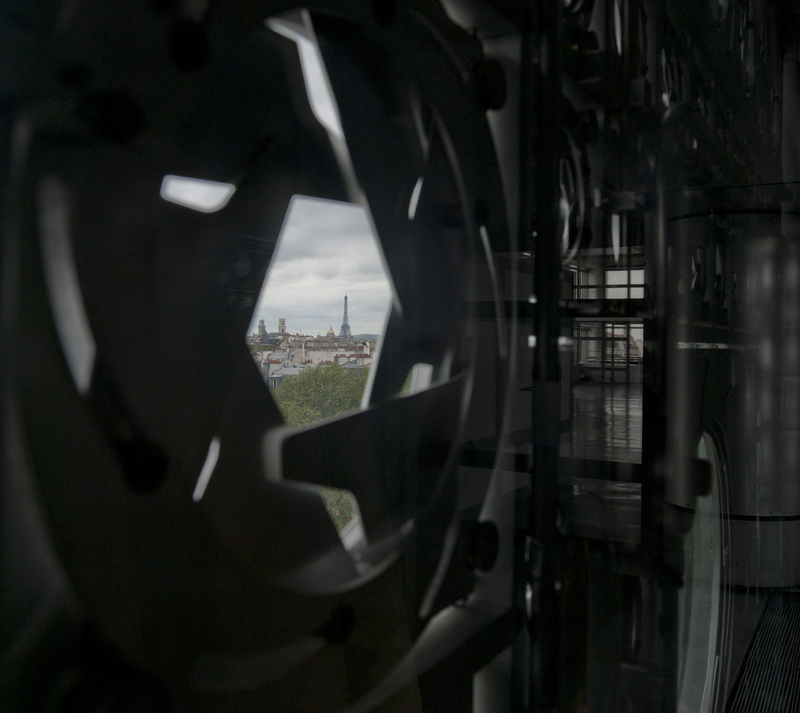 A view of Paris’ most famous landmark in the distance. 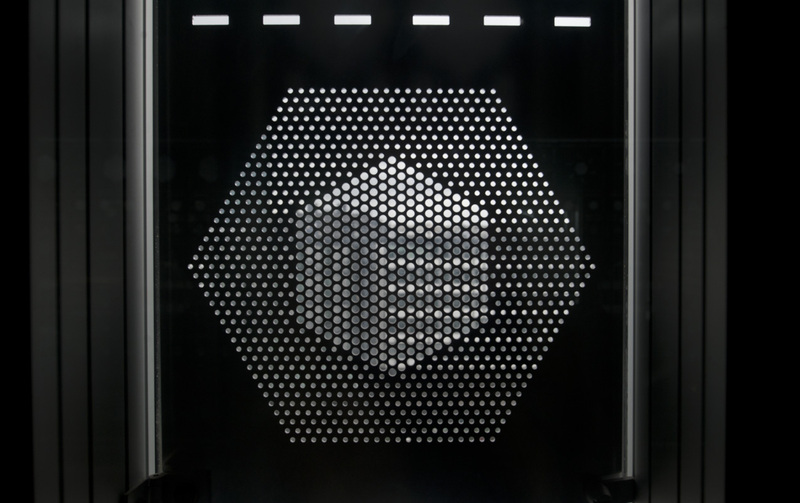 The perforated mesh portion of the screen shows how much can be achieved with a simple pattern. Zaha Hadid’s pavilion in the forecourt, which was closed, looks a little worse for wear. The quality of light achieved inside is really astounding, and definitely reminded me of some of my experiences in Central Asia. Gloomy clouds hung over us all day today. I had been hoping to get into Labrouste’s library today, but was thwarted by a national holiday, the celebration of the end of World War II. 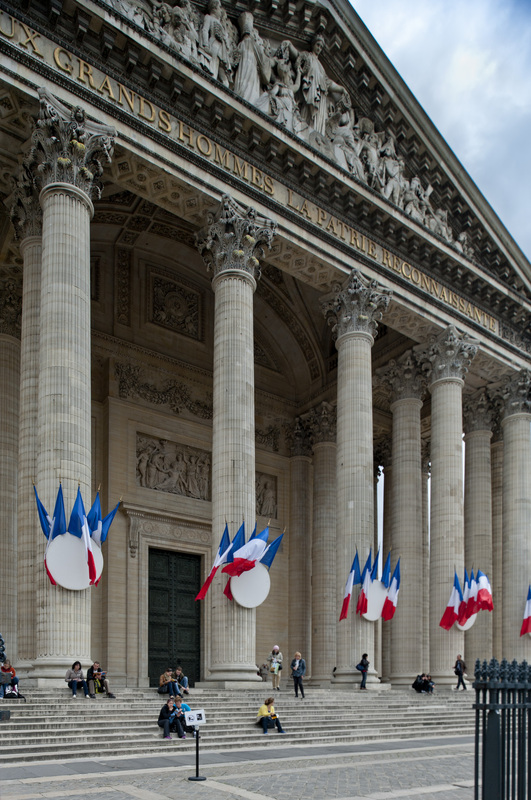 Souflot’s Pantheon was decked out in the tricolor flag. 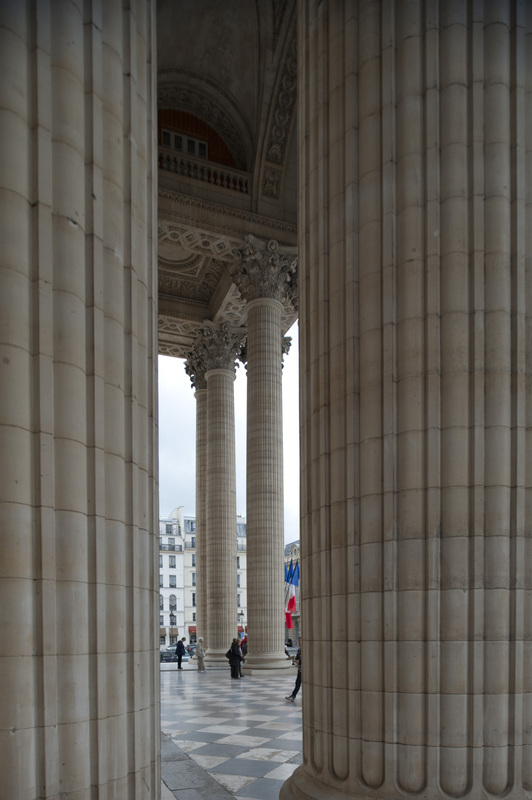 I’m not sure why, but the line was disturbingly long at the Pantheon, so we only made it as far as the front porch. We next made a trip to the neighborhood where my family once lived when I was a little urchin. 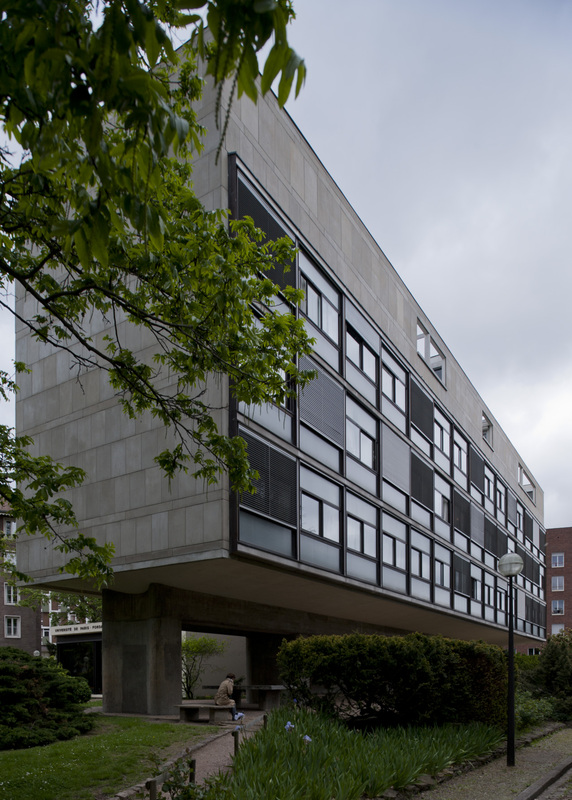 Although this building, the Swiss Pavilion, by le Corbusier was very close to our old apartment, I never knew its significance until I studied architectural history in college. This is the approach from the Southwest. I’m guessing that the building doesn’t attract too many tourists, but we were able to get in. 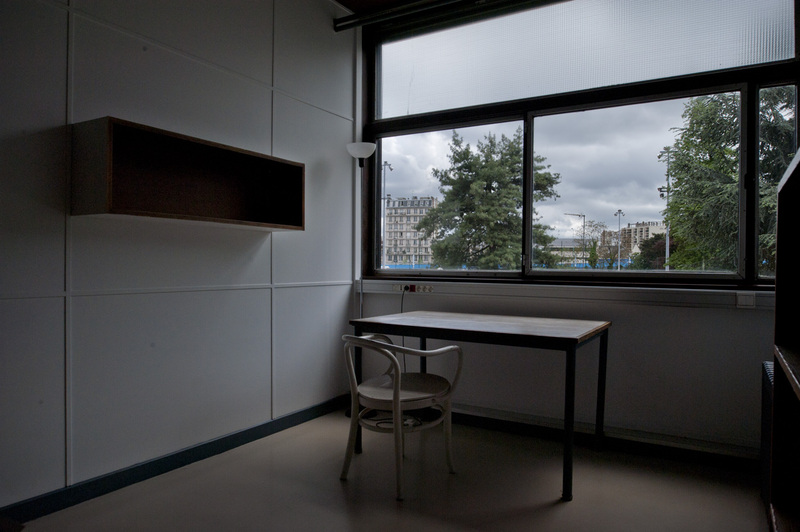 It still functions as a dormitory for visiting students and faculty. It has either been kept up very well since the 1920s, or it was built incredibly well. It looked almost brand new inside. 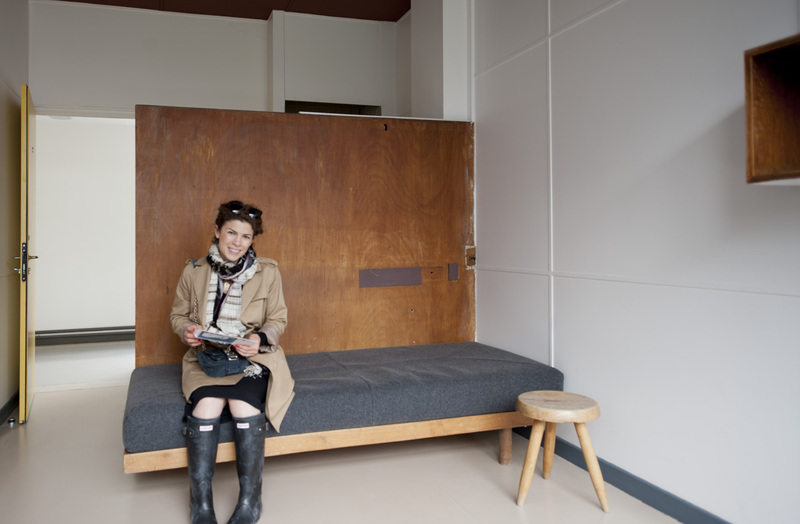 Here, Elizabeth tests out the meager bed in the one room that visitors are allowed to enter. Spartan furnishings and dark clouds rolling in. 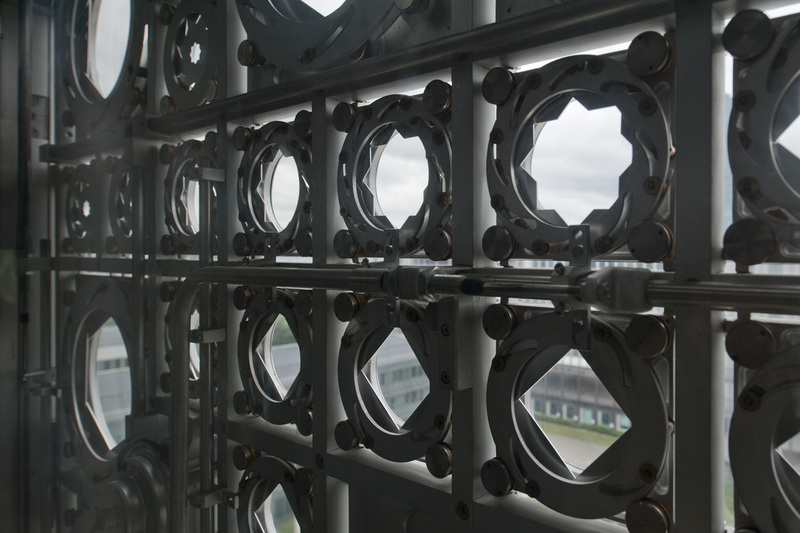 The dorm windows, which face south, are ribbon windows with a strip of translucent patterned glass up above. 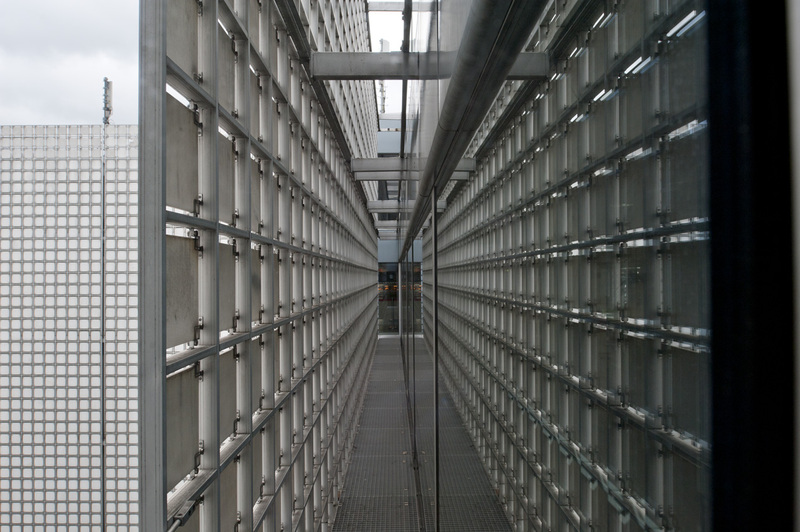 In the view from the southwest up above, the lower portion of glass below the ribbon window must be spandrel. 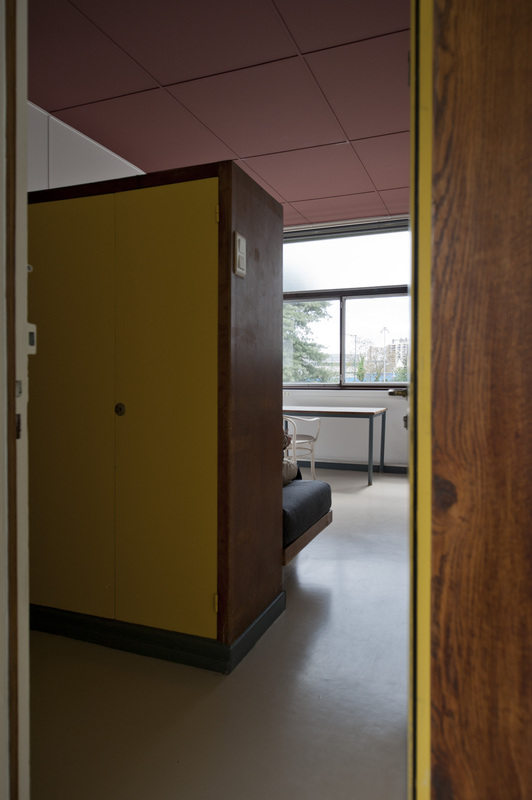 Most of the original photographs of this building are in black and white, so it never occurred to me how important color was to le Corbusier in this era. 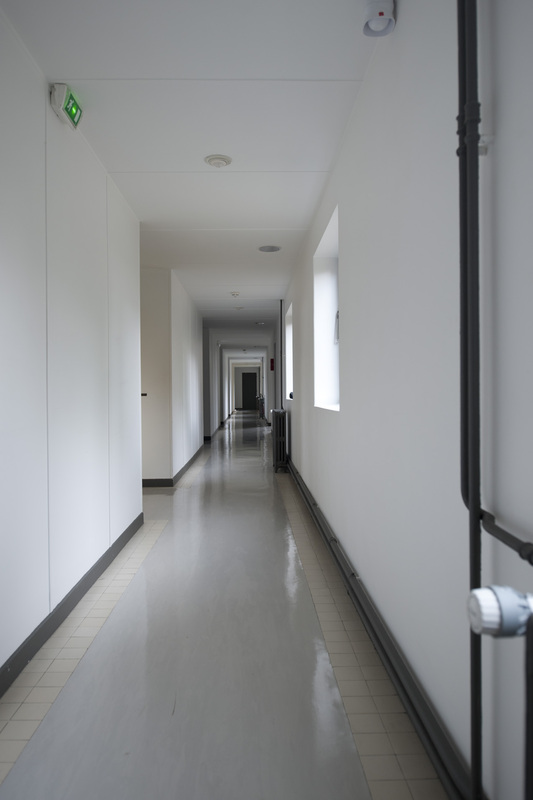 The single-loaded corridors define sterility, but have lots of light. 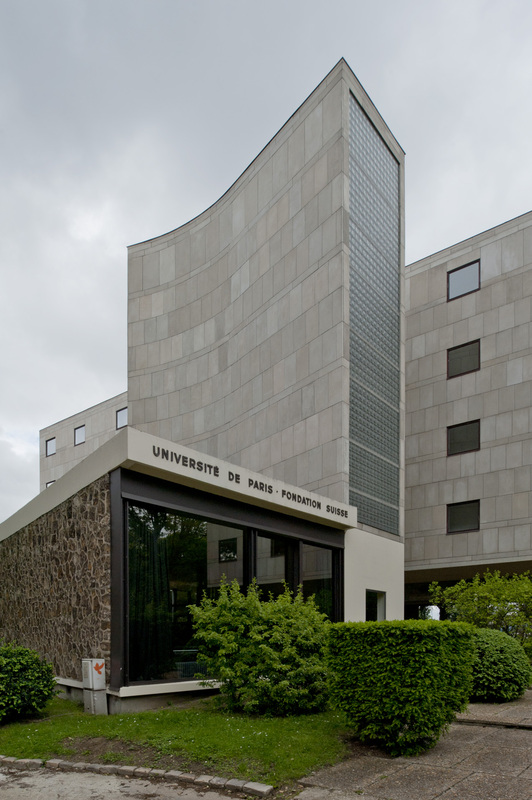 I wonder if Nouvel took a tour through le Corbusier’s Swiss Pavilion before he designed the Institute du Monde Arabe. Their subtle, but there are definite affinities. 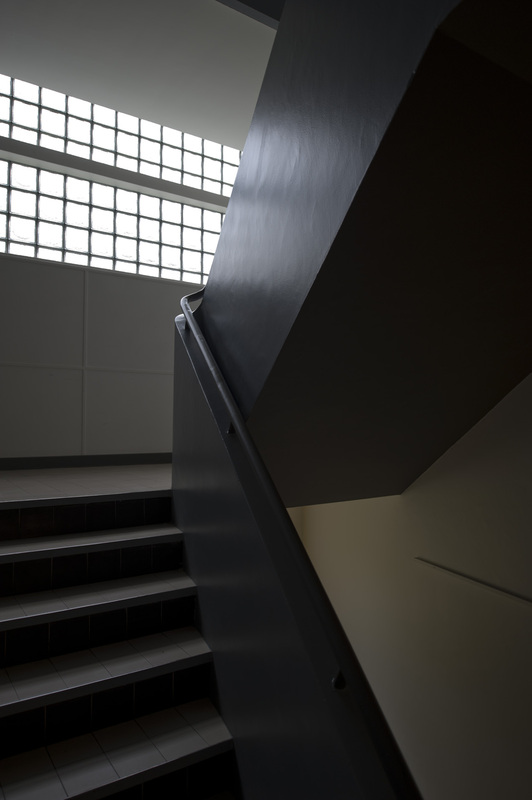 These glass blocks light the stairwell. A friend of mine had to model the Swiss Pavilion for our 3D modeling class. Late for class again! 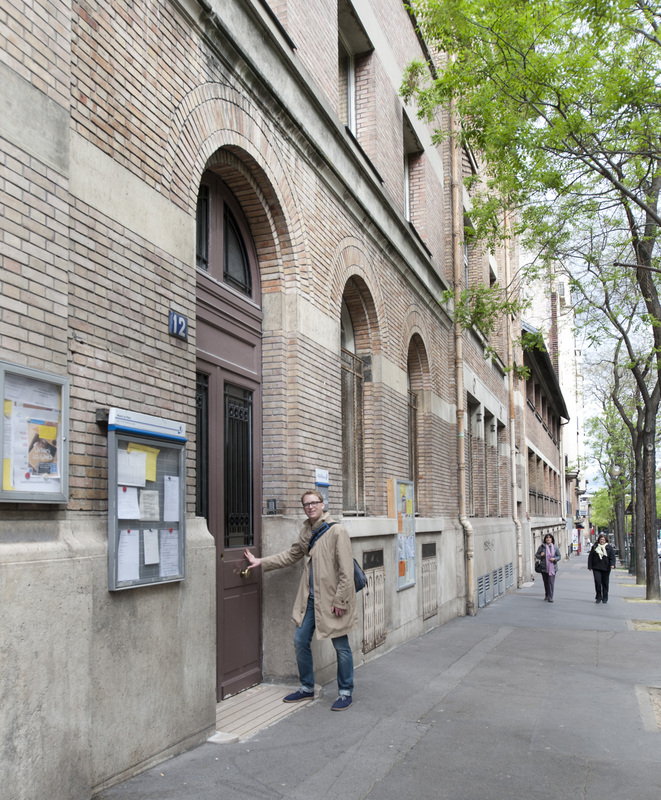 We walked by my old elementary school, site of some of my least fond memories from the brief time when we lived in Paris. This entry was posted in Uncategorized by thaddeuspj. Bookmark the permalink. Looks like a great trip. Great pictures. 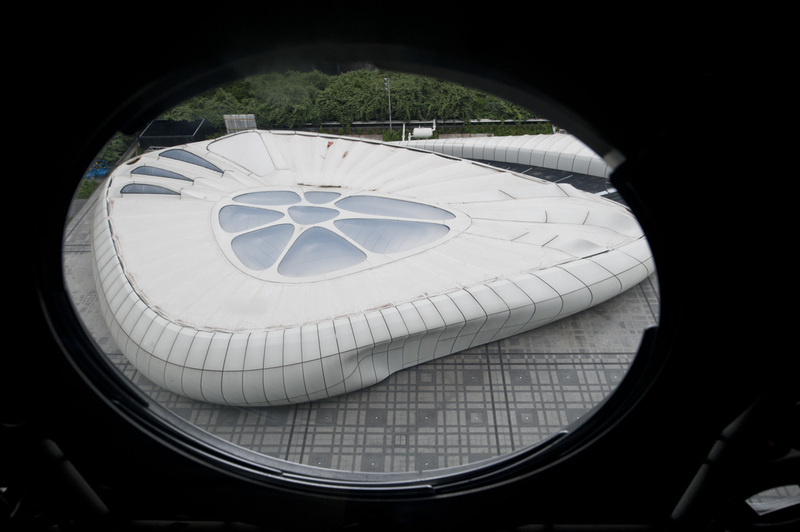 looks like a car ran into Zaha Hadid’s pavilion and left a dent, or is it supposed to be that way? Again, Tad takes us on a world tour, without having to leave our desk chairs! Wonderful. and I’m learning a little about design. Thanks Sandy L.